Every city has a lot of asphalt. But Los Angeles is one of the only cities where you can see unrefined asphalt bubbling out of the ground at a city park. 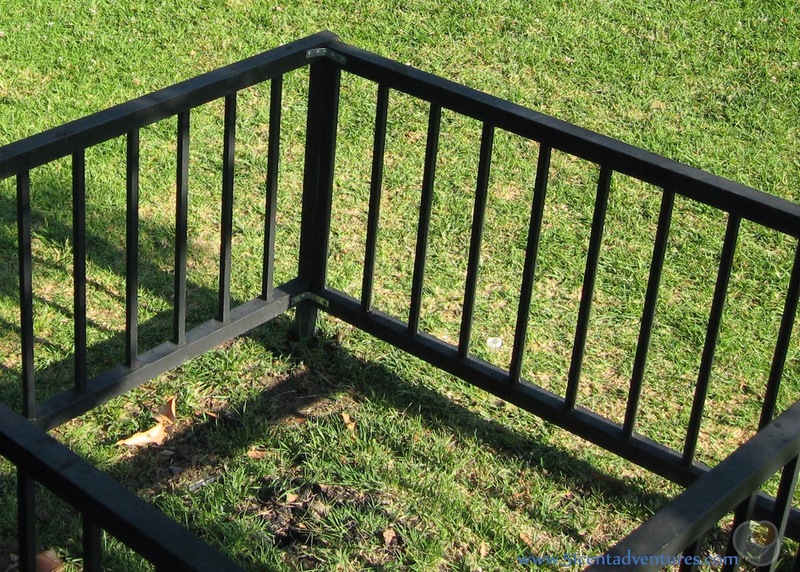 Cost: The tar pits themselves are free. The Page Museum is $12 for adults. The parking lot within Hancock Park is $9. Operating Seasons and Hours: Hancock Park where the tar pits are located is always open. The Page Museum is open from 9:30 to 5:00 everyday. Brandon and I decided to go to Southern California for our second anniversary. We made a list of everything that we wanted to see and do there. One of the things we wanted to do was see a taping of The Late Late Show with Craig Ferguson. We planned to drive from Las Vegas, check into our hotel in San Fernando, and then make it to the studio in Los Angeles in time for the afternoon taping. What we didn't plan for was the traffic. We ended up stuck in traffic and lost. We sadly acknowledged that we'd missed the taping. But that didn't mean the afternoon was ruined. 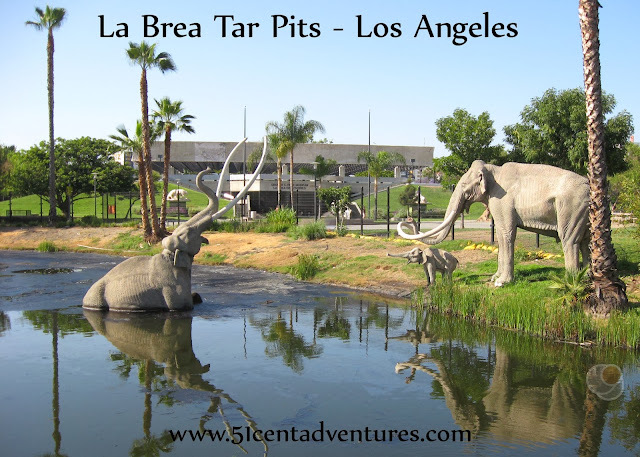 The studio was near the location of the La Brea Tar Pits, and we'd planned to make a quick stop to see those after the taping. So once we got off the freeway we stopped at a gas station and bought a very detailed map of the Los Angeles area. 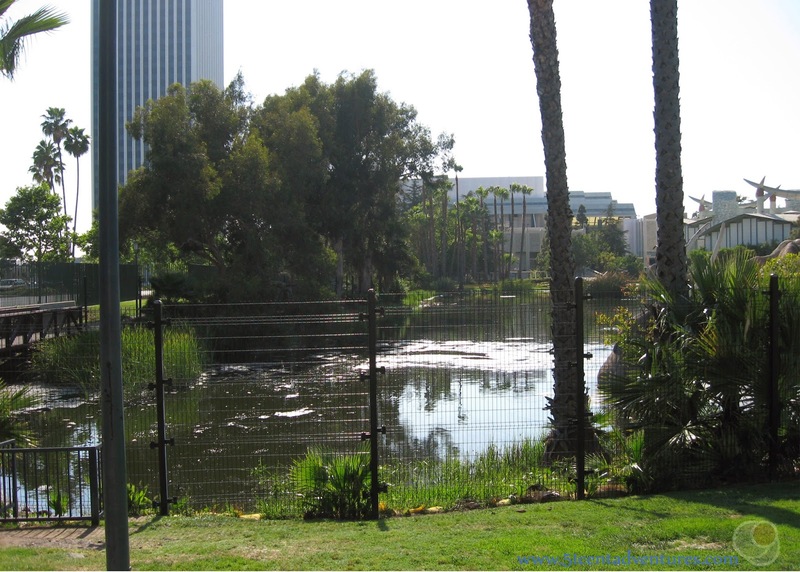 Then we navigated to Wilshire Boulevard and followed that to Hancock Park where the tar pits are located. We parked in the parking lot behind the Page Museum. The website says that the parking lot costs $9. I vaguely remember paying for parking and considering it our entrance fee into the park. We walked to the front of the Page Museum to see the Lake Pit. It was so bizarre to suddenly see a black lake in the middle of all the urban buildings. 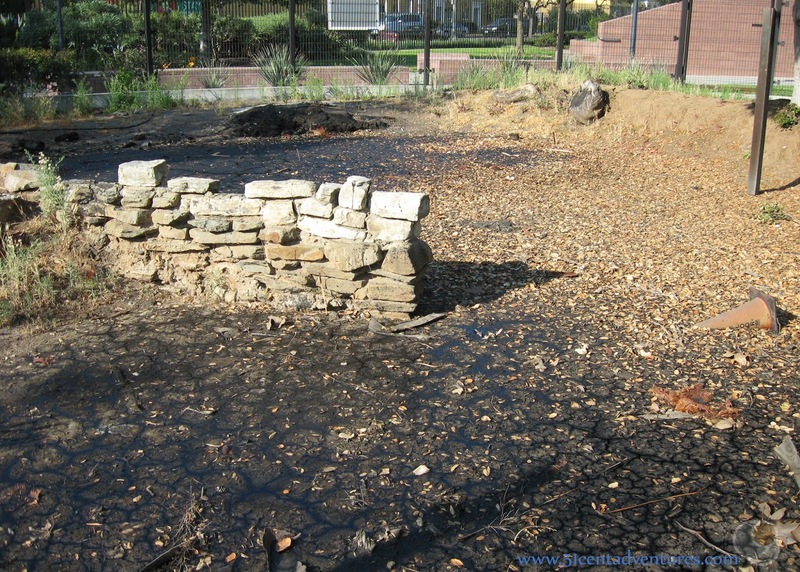 The "tar" of the tar pits is actually asphalt. Until I visited this place I had no idea that asphalt is a natural product. I always thought it was some sort of synthetic or something. The Lake Pit is full of bubbling asphalt. The bubbles are caused by the natural gas methane. Everything smelled like a road was being paved. We went inside the Page Museum, but balked at the cost of admission. Tickets for an adult are $12. We were students so our tickets would have been $9 a person. That was still too steep for us. We decided to just explore Hancock Park. According to the museum website there is a free tour offered for Hancock park, but we didn't know anything about that at the time. The park was a lot like any other city park. Grass and trees were everywhere. 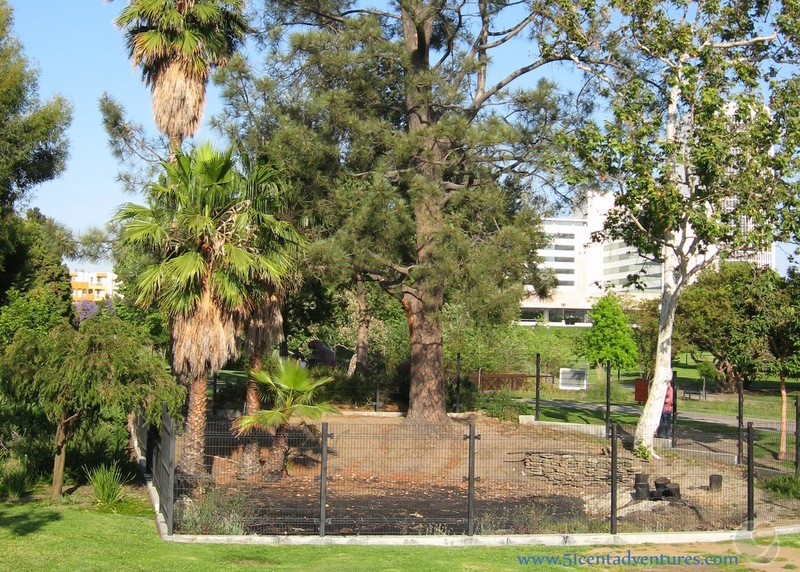 There were lots of things that most parks don't have - asphalt seeps, also known as tar pits. Some were little like this one. And some were big like this one. All of them were surrounded by fences. There were also lots of indications of ongoing paleontology work. These wooden boxes hold what is known as "Project 23." Three years earlier the a new underground parking structure was dug near the tar pits. Many fossils were discovered, but there wasn't time to do a traditional dig. Instead, boxes were built around the dirt. 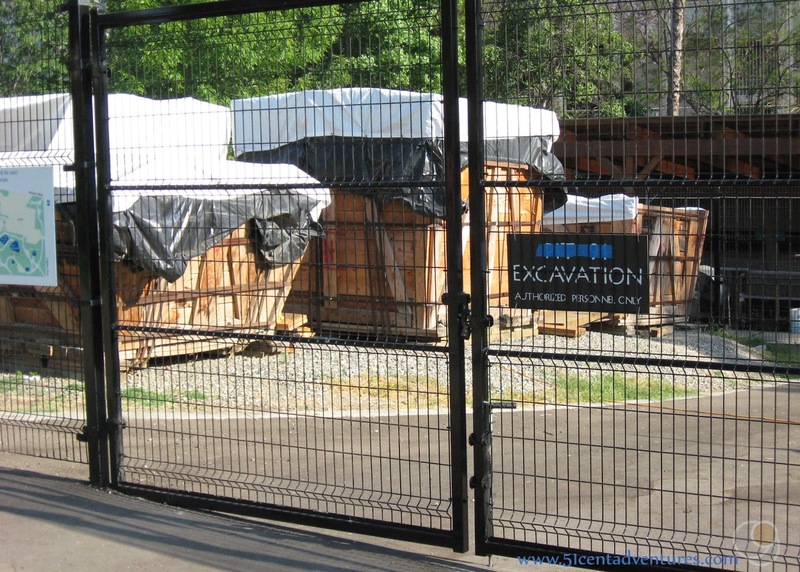 The boxes were moved to this area where they are stored until the paleontologists can sort through the dirt. There were also signs of old paleontology work. This is Pit 9. People began digging here in 1914. Many fossils came out of this spot. After the digging was completed asphalt slowly seeped into the pits from the ground. In addition to the interesting pits there were also some fiberglass statues of the animals that once lived in this area. Most notable were the lifesize family of Mammoths. 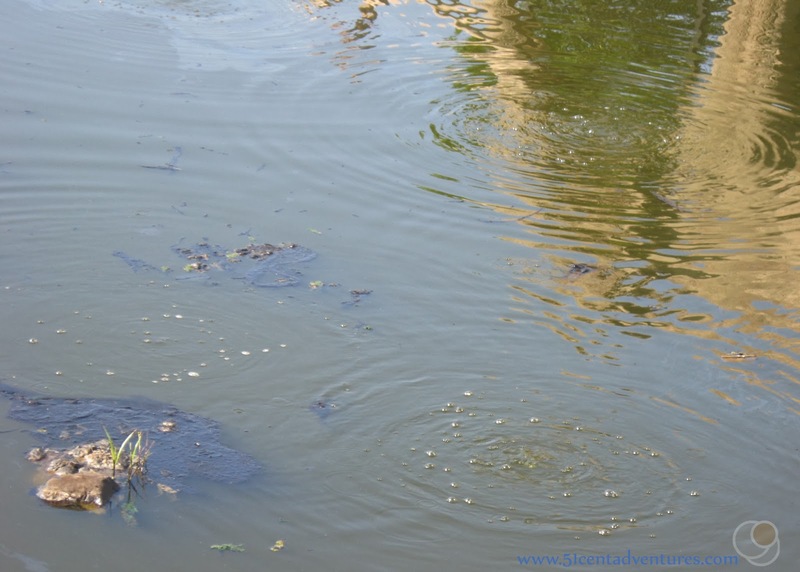 They depict the sad scene of a male and baby watching while a female struggles to get out of the Lake Pit. The statue of the female is even rigged up so you can see it slowly sink into the asphalt. My husband and I were bummed that we didn't get to see the Late Late Show taping, but we felt like we'd had a good afternoon anyway. We knew we could always watch the show on TV. We wouldn't always have a chance to see a bubbling asphalt seep. Directions: The tar pits are located about 7 miles west of downtown Los Angeles. You can reach the area via I-10, US-101, I-110, or I-405. Directions will vary based on what direction you are travelling from. Basically once you find Wilshire Boulevard you can find the tar pits. They are located on the north side of the road. 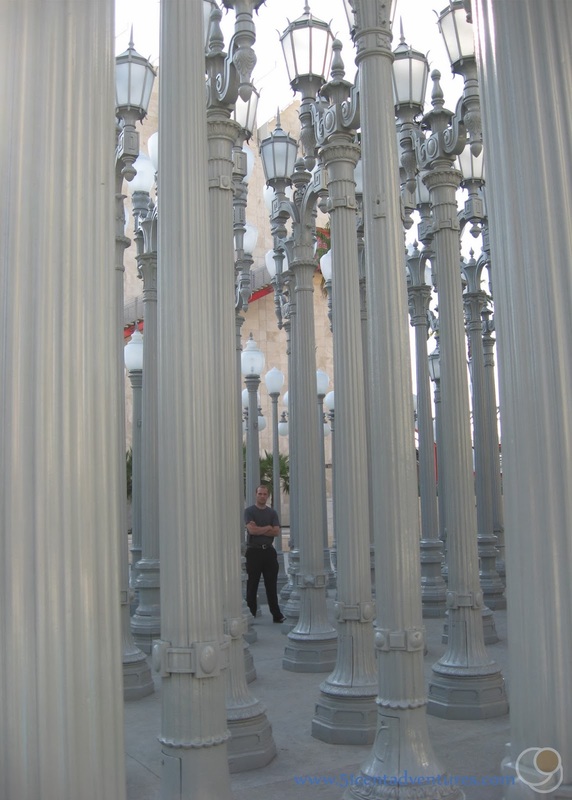 Places nearby: The Los Angeles County Museum of Art (LACMA) is located on the same city block as the tar pits and the Page Museum. We didn't go to any exhibits, but we did explore the outside. In front of the museum there is this really interesting group of street lights entitled Urban Light. 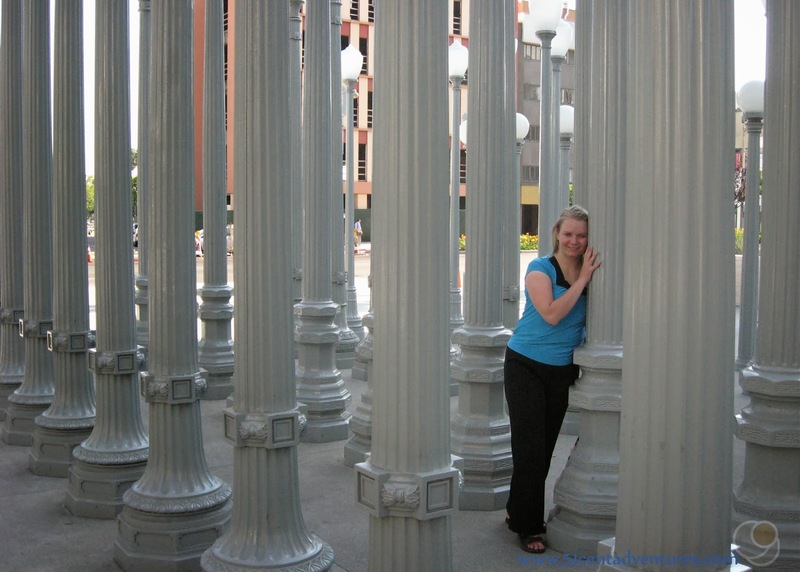 It is a collection of historic street lights that once lit streets in California. The lights had been installed the year before in 2008. Additional Information: Even though we didn't want to pay for a museum tour we still spent money in the gift shop. My husband saw a beautiful Periodic Table of the elements poster. It had an actual photograph of every element. We went back and forth on whether it was worth the $7 price. We ended up buying it, and never regretted the decision. You can see what it looks like and buy you own (for $2 less than we paid) by visiting http://periodictable.com/Posters/index.html.